Aries dated this axe to the Directory (1795/99) as it is marked with a Phrygian cap on a pike (a soft conical cap adopted as a symbol of liberty by the French revolutionaries) which was a typical marking for these years. Although this dates the axe later than the Ancien Régime he thought that the axe was representative of that period. It is thought that the drawing puts too much emphasis on the flare of the blade and the very slender spike. 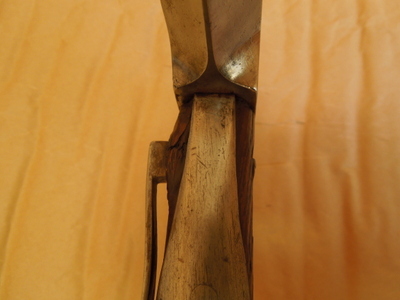 Note that the langets are short and curved to extend around the handle and the belt hook is riveted through the handle and turned back on itself. The handle was unusually long at around 28” (71 cm). In the early days of the revolution the monarchy destroyed large numbers of stockpiled weapons to keep them out of the hands of the revolutionaries. In common with other French weapons of the period this model is therefore extremely rare. Both Gilkerson and Aries used drawings to illustrate this model. 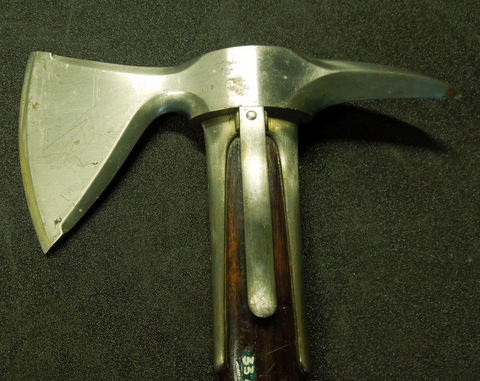 All French Boarding Axes share the same key features - a curved blade balanced with a four-sided spike of diamond cross-section and with front and rear langets. They were well designed, well made and beautifully balanced weapons as befitted the established arms industry of France. These key features remained common throughout the years, although the arc of the cutting edge varied as did the length, thickness and downward curvature of the spike, and the length and shape of the langets. Aries identifies several axes and suggests a period for each, and acknowledges earlier axes without belt hooks or langets. Gilkerson offers much more specific dates, suggesting models from 1786, 1801 (or An IX of the Revolution) and from 1833. However apart from the Modèle 1833 there is no evidence to suggest that specific models of boarding axes were introduced at these dates even though, for example, a new cutlass was introduced in 1801 by the Revolutionary Arms Committee. 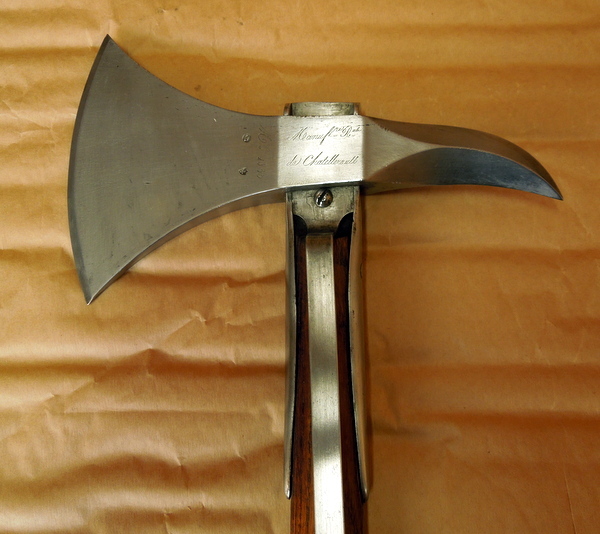 Axes do not require the same expertise to make as swords so most naval boarding axes were made by contractors and stamped with an anchor mark when accepted by the Navy. With many different manufacturers involved it is not surprising that although the basic form remains the same there are many slight variations in shape and dimensions. Haches d’armes, 24, de diférente façon, servant aux grenadiers et matelots, en cas d’occasion. By Villamage, draughtsman of the Galleys of His Majesty. This document, identified by Boudroit, lists the arms issued to a Galley and includes 24 axes of two designs, one with a crescent shaped blade and the other the more familiar flared edge, both with downward curving spikes. The document has a scale so that the dimensions of these axes are known. Both heads measure around 10” (25.5 cm) from point of spike to blade of axe and the one on the left is 21”(53 cm) long and the right is 16” (41 cm) long. It is clear that the flared rather than crescent shaped blade was adopted and this shape remained similar throughout the 18th and 19th centuries. Although there are no belt hooks shown, the crescent axe appears to be fitted with a (metal?) loop that would accommodate a lanyard. Perhaps the most obvious feature is the thicker and straighter spike. Underneath, the spike is almost straight with the point formed from the top edge downwards. The rear part of the central eye socket is often squared off rather than curved into the spike as in earlier models. 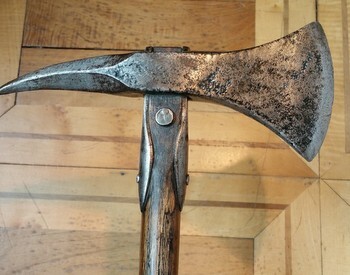 As many different manufacturers made axes with essentially the same shape over a span of two centuries it is very difficult to date French Boarding axes. As a rough guide - axes before 1770 did not have belt hooks and between that date and approximately 1800 belt hooks were attached by rivets through the shaft by several methods. From around 1800 the belt hook was slotted under the head and secured with a screw, including on the well documented Modèle 1833. There were many variations of the size and shape of langets or belt hooks, the curvature of the blade and the thickness of the spike and some early features appear on later axes. The longer spikes of the earlier models were prone to breaking off and with the end of the spike missing it may have been reformed to a shorter and straighter appearance. 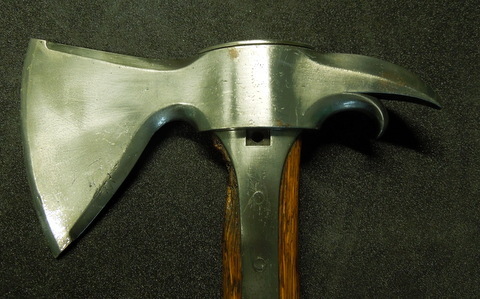 French boarding axes were exported to, and copied by several other countries, including America and the Netherlands. From about 1730 French regulation edged weapons were manufactured at Klingenthal. From 1797 to 1815 Solingen was also within the Empire. 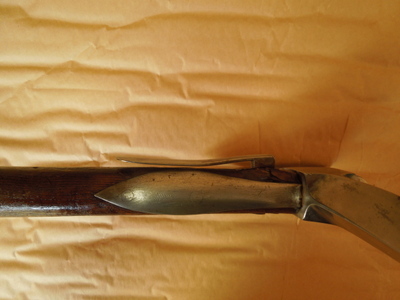 Under the 1810 and 1823 government contracts with the Klingenthal arsenal the Coulaux brothers who oversaw the business were only permitted to add their name to weapons produced for the commercial market. After 1836 production for government contracts was moved to Châtellerault while Klingenthal continued to produce tools and weapons for private purchase and it remained in the ownership of the Coulaux family until 1962 when it finally closed. Châtellerault was set up in 1818 and in 1836 the manufacture of regulation patterns was moved there. In general terms axes of the Ancien Régime had riveted belt hooks, where fitted, and shorter, curved langets. From the 1704 drawing above we see that there was a loop attached to enable the fitting of a lanyard. A drawing attached to a document in the Archives of the Artillery dated Oct 1762 shows an axe with no langets or belt hook and refers to the purchase in 1756 of “…battle axe used by the king’s ships” and also asks what improvements would be feasible. It seems probable that belt hooks and langets were adopted as standard soon after. Jack Vargo (ref: The Spike Tomahawk) describes an axe recovered from the wreck of La Machault, which was sunk in 1760 in the Gulf of St Lawrence and a similar one found at Fortress Louisbourg in Nova Scotia. These axes differ from the usual French shape in that the blades are straight edged on three sides and the spike is flat without the diamond cross-section. This probably indicates colonial manufacturer. The axe from the wreck was fitted with an all iron handle probably as a shipboard repair while the other had the more usual wooden handle with front and rear langets. Neither axe was fitted with a belt hook. A scale drawing of a Navy Arms Inventory dated 1771 and a drawing that accompanies a document of Royal Ordinance dated 24 May 1776, also to scale, show boarding axes with a simple belt hook of approximately 3.5 inches long which appears to be held to the shaft with a rivet. An axe at the National Marine Museum in Paris has a belt hook which is itself turned through a right angle to form the rivet which passes through the shaft. This is the only example known to this author and is pictured below. French Boarding axes manufactured before the end of the 18th century are most likely to have a riveted type of belt hook fixture. It is probable that the latter two are later versions as they add an improvement of lifting the hook away from the shaft. Screw threads have been in use since Roman times but each screw had to be painstakingly made by hand. Not until the end of the 18th century and the introduction of hand operated machines for manufacturing screws did they become uniform, more readily available and cheap. 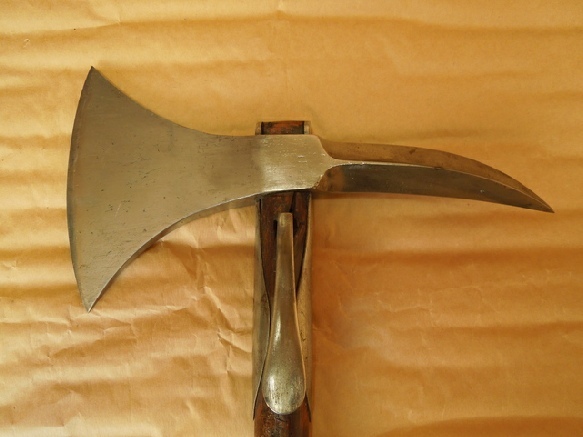 The earliest known axe with a belt hook with screw fixing appears in ‘Boarders Away’ and is marked GP F. Although it is not known what the initials stand for they also appear on a cutlass datable to the First Republic (1792 - 1804) with GP F considered to be the manufacturer (ref: Le Sabre d’Abordage - M. Pétard). In summary it seems likely that the method of attaching the belt hook by inserting an extension under the head and fixing it with a screw was introduced around the turn of the century and possibly as early as the 1790s. These two axes are shown in scale drawings of Naval Inventories dated 1771 and 1776. In both cases the langets are approximately 3.5” (9 cm) long and lobed around the shaft. The belt hook is of a similar length and is shown flat and riveted directly through the shaft with no indication how it is raised to accommodate the thickness of a belt or sash. This axe is very similar in shape to the ones above and is on display in the Marine Museum in Paris. The langets are 4” long and the belt hook is formed with shoulder and right angle to form its own rivet as shown in the pictures below. As can be seen it has been damaged at some point and has been partially dislodged damaging the wood of the shaft. 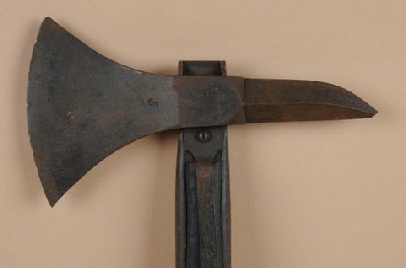 The total length is similar to that adopted with later axes and because of the improved belt hook it is thought that this axe is later than 1776. In this axe the handle length is similar to later axes as is the blade to point measurement although a very small part of the spike has been broken off. Note the belt hook turned back on itself and riveted through the wood rather than secured beneath the head. The scored lines on the handle also closely match Aries’s drawing and these lines also appear on the axe to the left in the 1704 drawing above. Gilkerson noted that this axe most closely resembled the ones supplied by the French to American ships and John Paul Jones’s Bon Homme Richard, during the Revolutionary War. 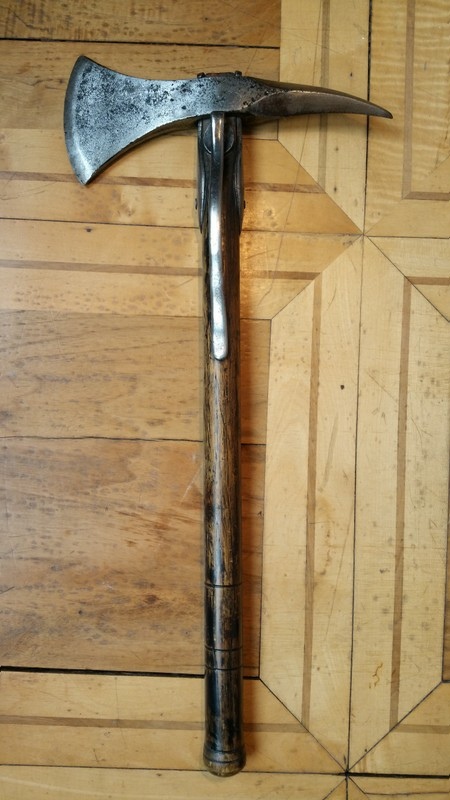 The shaft is significantly longer than the later axes but there is no provision for a belt hook. This axe is featured in ‘Boarders Away’ and is now part of the Sim Comfort Collection. 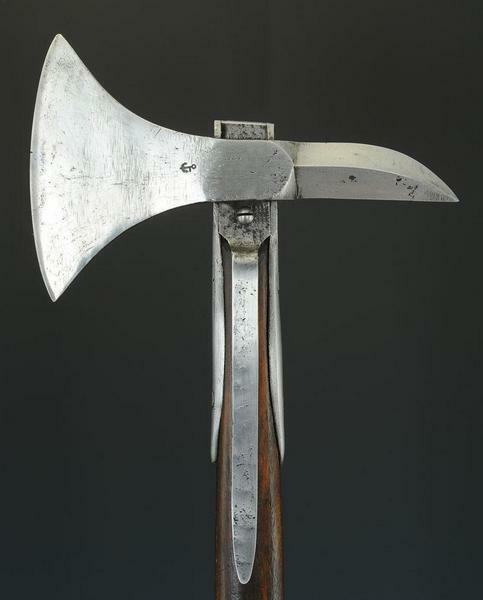 It is possible that the American Navy preferred their axes without belt hooks. 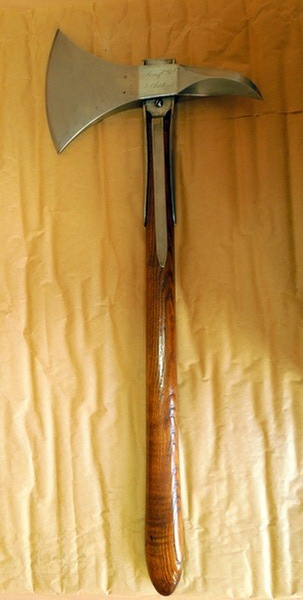 French axes found in the US are sometimes seen with the belt hooks cut off and often they have not been refitted when re-shafted. Sometimes referred to as the 1801 model or AN IX, (year 9 of the revolutionary calendar). The shape of this axe blade and spike show very little difference to earlier axes. The belt hook is fitted beneath the head and held in place with a single screw so that the wood is no longer weakened by a rivet through it. The belt hook has been cut off on the example to the right. 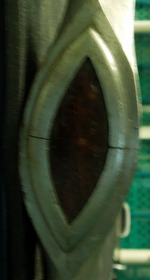 The belt hook and langets are longer and the langets are often less curved around the shaft. The spike tends to be approximately 2 mm less in thickness than 1833 axes but appears slimmer due to its increased length. In 1833 the Ministry of War commissioned a new suite of weapons for the navy which included a revised cutlass, boarding axe, pike and boarding knife with a new model pistol following soon after. This was known as the Système 1833 suite of weapons. The 1833 boarding axe was specified by the Ministry of War with a comprehensive set of dimensions covering every aspect of the blade, langets and belt hook. 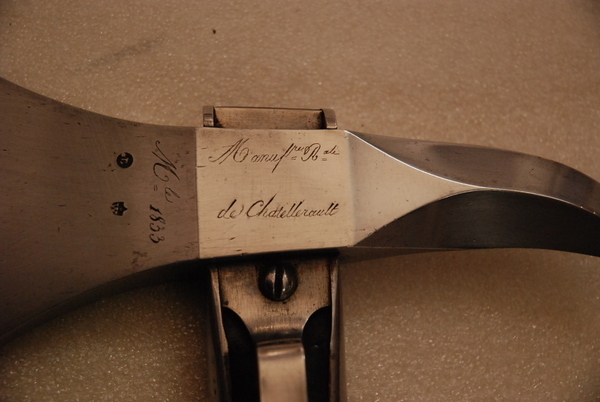 Both the National Marine Museum and the Army (Artillery) Museum in Paris have examples of this axe which are clearly marked Modèle 1833, made in Châtellerault and are stamped with the inspector and director poinçons that date them to 1836/1837. These may be patterns rather than production axes as it is not known if Châtellerault manufactured them in any quantity, as most boarding axes, if marked at all, bear only the anchor of the navy acceptance mark. The first 1833 cutlass was not produced until 1835 so it is possible that the first axe was not made until 1836. The knife came later in 1837. This variant with the longer straighter spike which is often referred to as the 1833 type was also manufactured during this period and was probably available both before and after the government specified 1833. Examples are known with the anchor mark so it was supplied to the navy and there are also examples marked to the Coulaux brothers which show them as available for private purchase. It is possible that this variant is the Klingenthal product of that period. These dimensions are taken from a document in the archives of the French Artillery titled “Ministère de la Guerre. Dimensions de la hache d’abordage” and dated 17.07.1835 and signed by the Chief of the Bureau de L’Artillerie. It is not known how closely manufacturers stuck to these dimensions but many 1833 axes bearing the anchor mark appear very similar to this pattern. This axe has a shorter spike than earlier axes making it much more compact. The spike is now 8.4 cm (3.3”) instead of an average of 12 cm (4.7”) or longer which was the norm earlier in the century. The National Marine Museum has in storage the two axes shown below with the only recorded information being that the museum received them from the French Navy who were in possession of them some time before 1900. These match no other known type but are almost certainly designed as boarding axes with distinctive features. In 1872 as part of a series of naval reforms Rear Admiral Exelmans commissioned the 1872 model cutlass and a small number were manufactured at Châtellerault. No further production took place and the cutlass was not adopted as standard issue. It is possible that these two axes were prototypes developed to be part of the 1872 system but were not taken beyond the prototype stage. The fact that the two axes are similar but with different features suggest prototypes. They both have similar shaped blades, heads and dimensions. Axe 1 has front and rear langets while the other has side langets. The spike on Axe 2 has been formed to include a hook, formalising a primary function of the spike into an actual form and perhaps inspired by the US toothed blade which was designed to help snag rope. Both axes are well machined and of high quality indicating their manufacture late in the century. This is further confirmed by the belt hook attachment which is the same on both although missing from Axe 2. The belt hook has a raised shoulder which is located in a square socket cut into the langet and is secured in place by a machine bolt that passes through both langets and is located into a screwed thread in the steel belt hook. The langets on both axes pass under the head and are precisely fitted around the head of the shaft which is reminiscent of the US Type III dome. Perhaps these would have been the ‘ultimate boarding axe’ if they had ever been produced. They are sturdier with the layout of langets and belt hook providing a high level of protection and have adopted the best design features from earlier axes. Unfortunately they arrived too late as the age of fighting sail was already past.